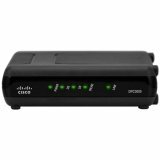 The Cisco Model DPC3000 DOCSIS 3.0 Cable Modem (DPC3000) provides DOCSIS broadband service providers with a cost-effective solution for delivering high-speed bi-directional data services. The DPC3000 provides a faster connection to the Internet by incorporating four bonded downstream channels along with four bonded upstream channels. These bonded channels deliver downstream data rates in excess of 160 Mbps and upstream data rates up to 120 Mbps, up to four times faster than conventional single-channel DOCSIS 2.0 cable modems.